Another season of Quinnipiac hockey has come to an end and despite coming up one game short of the Frozen Four, this was a magical season that began with little expectations of reaching of regional final. 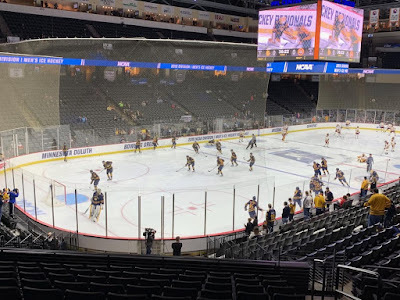 Quinnipiac fell to the defending national champion Minnesota Duluth Bulldogs 3-1 on Sunday night in Allentown, PA to finish the season 26-10-2 while Minnesota Duluth will head to its third straight Frozen Four in Buffalo. Here are my thoughts and observations from the game. - It was a tough way to see the season end but in reality the better team won this game. Minnesota Duluth is the defending champions for a reason as they play the game the right way. Duluth played the game on their terms right from the get go. It was apparent in the first period this was going to be a major grind for Quinnipiac. The Bobcats are at their best when they are playing from ahead and even though there was no score in the first period along with no score most of the second period, it seemed like they were chasing them all game despite the scored being tied. Duluth loves to slow the game down and play at a methodical pace and they smothered Quinnipiac into submission. They have some high end defensemen that retrieve pucks, move pucks quickly out of the zone and out muscle opponents in the neutral zone. They rarely gave Quinnipiac any time and space and without that the Bobcats couldn't get anything going. - Quinnipiac played better in the third period and had some nice looks but just couldn't finish their chances especially with some open nets. They didn't really challenge Hunter Shepard much in this game but much of that was due in part to the Duluth defense which is outstanding. Scott Perunovich, Dylan Samberg and Mikey Anderson are all really sound and skilled players. All three of them should be in the NHL within the next couple of years. - I'm really impressed with the way Duluth plays their game as I don't get to watch this team very often here in the east but they are as good as any team I have seen in the past couple of years. They are well coached behind the bench with Scott Sandelin running the show. He's the best coach remaining in the NCAA tournament in my opinion and Duluth should be favored to win the title in Buffalo. - This team doesn't have anything to be ashamed about. They won 26 games, reached the Midwest Regional Final, won a share of the Cleary Cup all while being picked 8th in the ECAC preseason polls and having 13 freshman on the roster. It was an outstanding season and one not many people saw coming from outside that locker room. These players restored the Quinnipiac culture and they should be proud of that regardless of the loss to Minnesota Duluth. I think this may be my third favorite season behind the 2015-2016 season and 2012-2013 season. - One thing that I hope that comes of this loss are possible future games against Duluth. I hope that Rand Pecknold and Scott Sandelin at least discussed that possibility after last nights game. Adding a power house team like Duluth to a future schedule would be a coup for Quinnipiac as you want to be able to consistently play against the best teams in the country and frankly most of the best teams arise in the NCHC having won the last three national championships. - I tweeted this last night and I will say it again. I think that if Brandon Fortunato does not go down with a season ending injury that Quinnipiac would have reached the Frozen Four. He was that important this team and you saw that the teams fortunes changed with that injury. Prior to the injury Quinnipiac was 20-5-1 and a possible #1 seed in the NCAA tournament. After his injury they went 6-5-1 and ended up in the same region as the defending national champions. The power play also suffered as when he was healthy it was over 28% and without him that dropped to just over 17%. Quinnipiac probably would not have had to face Minnesota Duluth in a regional had Fortunato not gotten hurt and we probably would be making plans for Buffalo right now but that is sports and injuries happen. There was just no possible way they were going to replace a player of Fortunato's caliber that late in the season. - Not only did the injury to Fortunato hurt to the team I think it affected Chase Priskie's play as well. I don't think anything less of Priskie, but when Fortunato went down he really had to assume more defensive responsibility and his offensive game suffered as a result. In the ten games he played since Fortunato went down, he had six points on three goals and three assists but six of his last eight games he was held off the score sheet. Without Fortunato, teams could likely key more on Priskie in order to limit the Bobcats offensive game. Priskie will go down as one of the best players ever to play at Quinnipiac and he should have a really solid professional career. - Craig Martin's power play goal was the teams first since February 22nd in a 7-2 win against St. Lawrence. However it came with an extra attacker as Rand Pecknold pulled the goaltender to give Quinnipiac a 6 on 4 advantage. It just shows you how difficult of a time they had on the power play once Fortunato went down. - It was a tough ending to the season for the Quinnipiac top line of Odeen Tufto, Wyatt Bongiovanni and Ethan de Jong as they were held scoreless in their last four games. Last night they struggled to fight through traffic against a strong Minnesota Duluth fore check but we have to remember two of these players are freshman and there are going to be struggles. Unfortunately for Quinnipiac, it happened at the wrong time late in the season. They will learn from this experience and will get better as a result of it. - Andrew Shortridge was really good last night and kept Quinnipiac within striking distance in this game. He made 23 saves on the night and made some really nice saves. The first goal he almost got to while the second one came on an odd man rush that I wouldn't fault him on. Usually odd man rushes lead to goal unless the offensive team screws it up. In that instance Minnesota Duluth didn't screw it up. Shortridge had an outstanding year for this team and was one of the big reasons they won 26 games this year. He's one of the best goalies to put on a Quinnipiac jersey following Eric Hartzell and Michael Garteig. If this was his last game in a Quinnipiac uniform he did everything he could to try to lead the Bobcats to victory. It just wasn't in the cards. - The foundation for future success has been laid. Now they just need to add some more talent around that foundation in order for this team to take the next step to get back to the Frozen Four. However we need to see which players return as Andrew Shortridge, Brogan Rafferty and Karlis Cukste all could depart for professional contracts. If all return then Quinnipiac should be in good shape though it two or all of them leave then the back end of the Bobcats will have been pretty much gutted.